Brussels sprouts and fall fruits just belong together. Brussels sprouts and grapes? Trust me, it works! Brussels sprouts and pomegranate? Yes! But my favorite combination of all is Brussels sprouts and apples. The sweetness of the apples is the perfect foil for the assertive flavor of the sprouts. They complement each other so well, once you’ve tried the two together, it becomes hard to ever serve them separately. Have I convinced you yet? 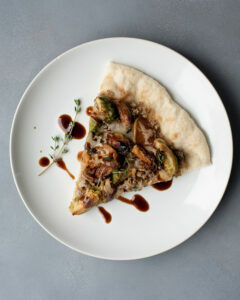 Well, if I haven’t, maybe this Brussels Sprout and Apple Pizza will. I’ve made this before, but I never took the step of actually writing down the recipe until now. (Sidenote: this is why I love making pizzas at home. You can experiment! You don’t need a recipe!) Because I’m all about saving time where I can, I always start with a pre-made crust. I skip the sauce and use a nutty pesto instead; a light sprinkle of fontina has a mild flavor that lets the stars of this recipe shine: the apples and Brussels sprouts. Because they won’t be spending enough time in the oven to cook fully, I sauté the two together in a skillet with a little bit of honey and thyme. The Brussels sprouts will get brown and crisp once baked, and then the whole thing is drizzled with balsamic vinegar before serving. If you’re into meal prep, this pizza works well for that. 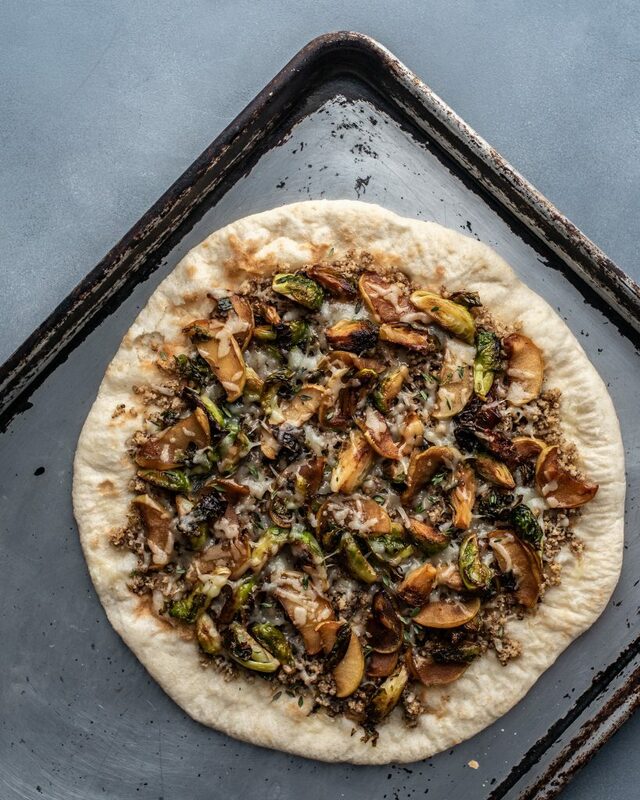 Just make the walnut pesto and Brussels sprout and apple sauté in advance and then assemble when you’re ready to eat. Super easy. 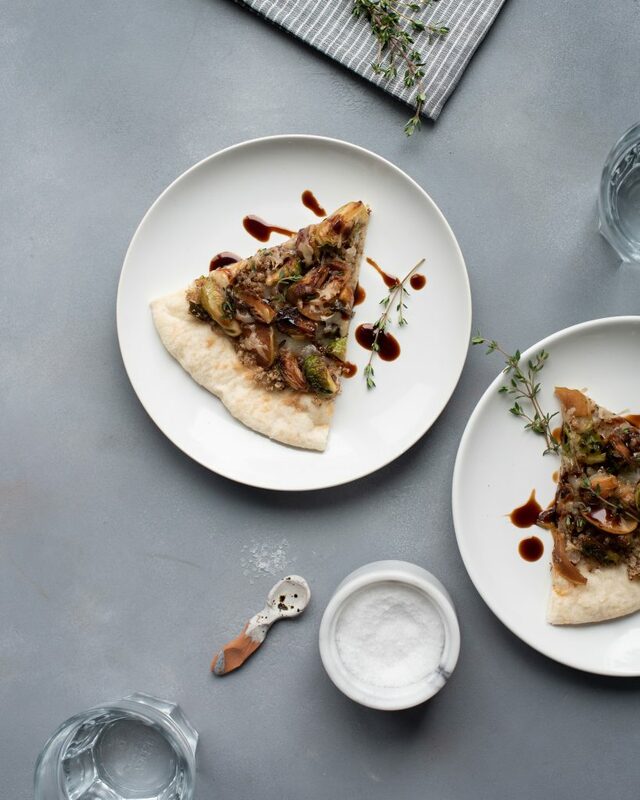 The perfect combination of sweet and savory, this pizza is a favorite for fall. Preheat oven to 425ºF (or temperature on crust package). Put the walnuts, cheese and 1 tablespoon olive oil in a food processor and process until crumbly. Season with salt and pepper. Heat the remaining oil in a large skillet over medium heat. Add the Brussels sprouts and apple slices; cook about 8 minutes, or until apples and sprouts are beginning to brown. Stir in the honey and thyme, then remove from heat and season to taste with salt and pepper. Top the pizza crust with the walnut mixture, shredded fontina and the sautéed Brussels sprouts and apples. Bake for 10-15 minutes, or follow the directions on the package of the crust. Drizzle with balsamic glaze and serve.